Numbers is a very practical addition to the other iWork apps on iPad. 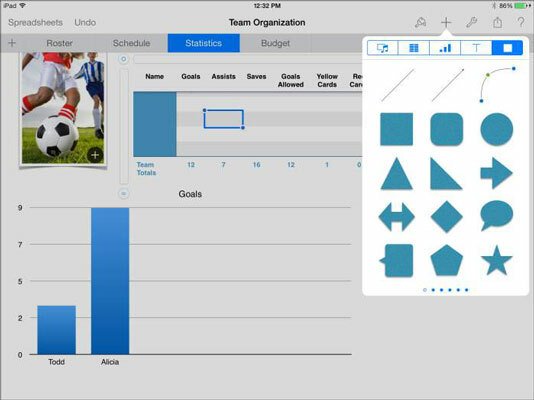 Tables and charts are built into Keynote and Pages, but Numbers is the main number-crunching tool on iPad. Numbers is a different approach to the concept of spreadsheets. It brings to spreadsheets not only a different kind of structure, but also data formats you may never have seen. In addition to being able to use numbers and text in your spreadsheets, you can use on-off check boxes and star ratings as part of your data. Think of an inventory spreadsheet with check boxes for in-stock items and star ratings based on reviews or user feedback. What you may have thought of as just a bunch of numbers can now provide true meaning and context to users. A Numbers document: A container for all elements, including worksheets (sheets) and their data; similar to a Microsoft Excel workbook. One or more sheets: One or more spreadsheets called simply sheets. The simple idea of making tables into an actual part of the Numbers application rather than letting people create them any which way leads to a major change in the way you can use Numbers when compared to other spreadsheet programs. Because a table is an entity of its own and not a range of cells, you don’t break the tables you’ve organized in a spreadsheet when you reformat another part of the spreadsheet. You can work within any table, and you can reorganize tables within a sheet, but you can’t break tables by simply adding a row or column to your spreadsheet. 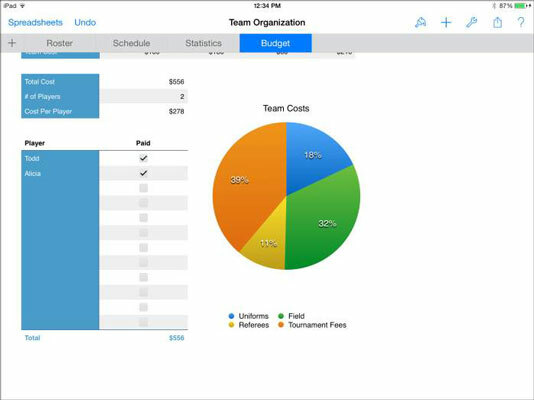 This figure shows a Numbers for Mac template (Team Organization). Some sheets contain tables or charts, and you see them listed in the Sheets pane under their corresponding documents. 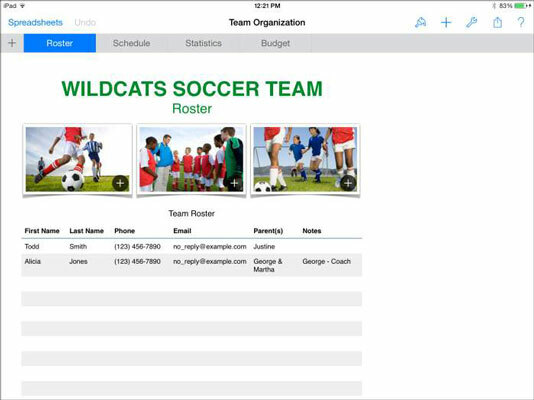 For example, the Roster sheet contains the Team Roster and Team Management tables (scroll down to see the Team Management tables). The Budget sheet contains the Cost Breakdown table as well as a chart (Team Costs). The idea that a single sheet can contain defined charts and tables that don’t depend on ranges of cells is the biggest difference between Numbers and almost every other spreadsheet program. As you can see in the figure, sheets can also contain images and other graphics; they aren’t part of the structure of charts and tables. You simply insert these elements the same way you insert any other objects in iWork documents. There are various tools available to you in the top-right corner of Numbers, as with other iWorks apps. This toolbar includes buttons for formatting tables, inserting photos, inserting charts, adding text, and inserting shapes (see the figure). Numbers also includes the ability to create forms, which simplify data entry. When you create a form, you select a table and you’re taken to a tab that displays each column heading with a text entry box next to it. You can then focus on entering data for one row at a time and eliminate the possibility of accidentally tapping and entering data in the wrong row.